Men in Black was a popular and fun film for 1997, but it never quite turned into the billion dollar franchise the other men in suits expected. I don’t claim to be the beating heart of American pop culture, but I’d never even heard that they made an animated series based on the film – and four seasons of it, at that. Naturally, one of the three games based on that series is even more obscure. The Men in Black always come prepared. 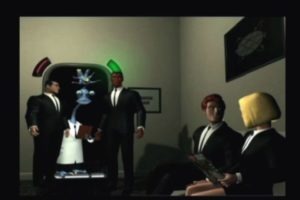 Men in Black: The Series: The Show: The Game is a PlayStation first person shooter set in the world of the films/show. You play as either Agent K or Agent J (dictated by the level) and use iconic weapons from the MiB arsenal to splatter hosts of alien n’er-do-wells. Fairly standard stuff, differentiated only by the coat of licensed paint. Though if you’re like me and found the first film a blast, then the ability to zap goofy aliens with a Series 4 De-Atomizer may be all the incentive you need to have a great time here. The wonders of YouTube granted me a passing familiarity with the show, so I can tell you that the game appears to based on the animated series’ fourth and final season (by the presence of Agent X and lab chief Dr. Zeeltor). Major baddies from the series makes appearances, including the Fmecks, Alien Mafia, and Alpha; the deranged ex-founder of MiB. There are 27 levels in all, divided into 9 chapters titled “Syndromes,” just like the show. The Syndromes don’t necessarily intertwine, but do follow an overall timeline of events over the course of the game. 27 levels seems beefy, but there’s only about 5-6 hours of gameplay here in total. However, there’s a great amount of variety. Crashdown makes excellent use of the episodic structure to change the nature of each chapter significantly – from fighting through a carnival funhouse, to shrinking down to Fmeck size and navigating an oversized backyard lawn, to limited stealth missions where you sneak around a warehouse and take pictures (don’t worry, the stealth isn’t rigidly enforced). 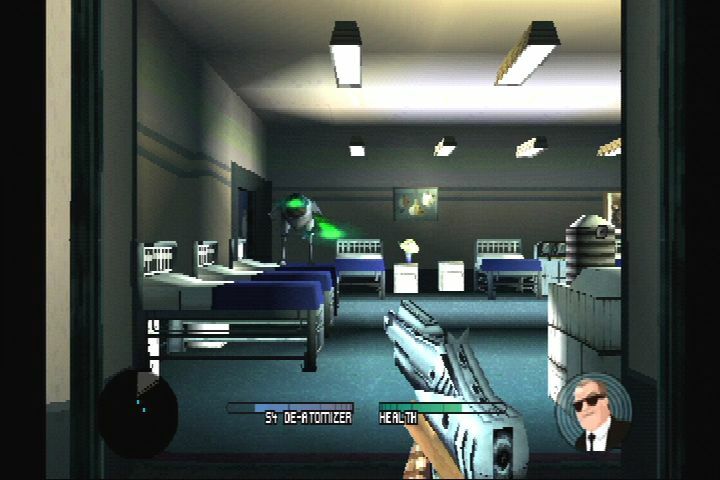 The core gameplay of shooting aliens never changes, but the locales certainly do, and the occasional objectives (like putting out fires with an extinguisher, guarding a VIP in the hospital, or Neuralyzing witnesses) keep things interesting. Deploy the neuralyzer and wipe his med school classes right out. There are 11 alien types in all, each with distinct advantages. All of them follow the strange humor of the series, so you’ll be facing giant crabs that hide in their shells to deflect damage, tiny backflipping ninja aliens, and unarmed waifs that explode when panicked. Your 10 available weapons are all energy-based, and include those seen in the film and more inspired by. The standard MiB pistol is a useful default, and your tools scale and expand from there. You’ll get access to grenades, energy chainguns, lightning guns, plasma launchers, and the simply divine Carbonizer – which launches a floating ball of insta-death so powerful that it gives Doom‘s BFG a run for its money. And yes, there is the infamous Noisy Cricket. And yes, it flings you backward every time you fire it. Pickups are limited to health kits and temporary powerups (like speed boosts and energy shields). Weapons are never reloaded, simply recharged by limited power sources hidden inside soda machines and fuse boxes within the levels. Each charger projects an icon of the weapon it will feed, and each will only charge one type, which encourages you to vary the weapons you use. You never select or customize your layout; it is always set up per level and occasionally supplemented by found weapons within the world. You also lose your weapons at nearly every level change – even within the same chapter – so there’s little reason to play conservatively. This late in the ‘Station’s life, developers had really gotten 3D engines down, and Crashdown benefits from this. 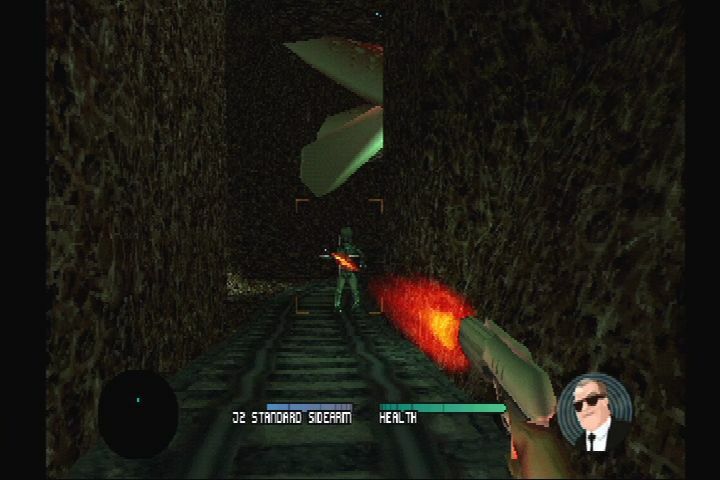 The game runs on a nice engine for the PSX, with colorful textures and believable geometry. 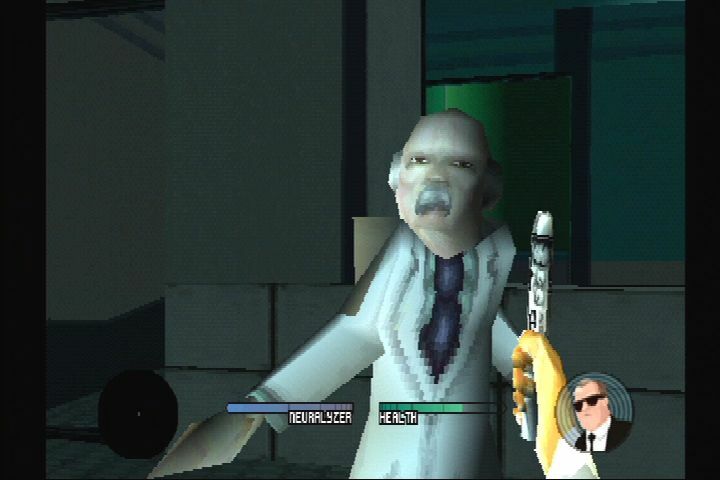 Texture warping exists (seemingly unavoidable on the PSX), but it is limited. Speed is quick and smooth. Levels are fairly large, and made larger by frequent battles impeding quick progress. Shooting is precise and responsive, and you’re allowed to look around and aim freely. Character models are blocky, but the less-humanoid aliens use the fewer polys to their advantage. It looks… just… like.. the shoooohhh no it doesn’t. Controls are designed for the Dual Shock, and make good use of those thumbsticks. The left stick handles forward/back moving and turning, exactly as you would expect. The right stick clumsily maps left/right strafing with looking up and down. This cannot be changed, but can be bypassed by keeping to the left stick and using the top shoulder buttons to sidestep. R2 can be held down to aim freely with the left stick, and Triangle snaps your view back to center. It’s a solid system, and while most guns feature some amount of auto aim, it handles those that don’t just as well. About the only complaint is that your weapons can only cycle one way, but you have such a small arsenal at any one time that this is hardly an issue. So what’s bad about Crashdown? For starters, it was clearly done on the cheap. The game itself is certainly competent, but the support from the franchise stamped on the box is minimal. Generic music is used on the title screen, instead of the intro theme to the show. Cutscenes (which bookend each chapter) are done in an awkward early-CG style, instead of the hand animation of the series. The voice actors aren’t credited anywhere, in-game or manual, but I’m pretty sure they’re not the actors from the show. J seems higher-pitched and whinier, and David Warner very obviously doesn’t reprise his role as Alpha. Writing is also inconsistent with either the film or what I’ve seen of the series. K is more stodgy and uptight than world-weary veteran, and J is more clumsy, spastic, and boisterous – more Chris Tucker than Will Smith. Not to mention that the very structure of fighting through levels solo takes away the interplay between J and K, which was arguably the highlight of the entire series. Levels also get reused just a tiny bit too often. Frequently, you’ll have to play a level both heading in and then again in reverse as you try to escape. You’ll return to one or two levels later in the story under different circumstances. And a few are just puzzlingly short, like the one-room levels where you have to guard someone against waves of attackers, or the levels containing only a boss fight. There’s great gameplay here, but it won’t completely satisfy. Lots and lots of bad guys. This one is entirely nitpicking, but it does seem the designers had a bit of trouble matching the themes of the show (contain and cover up small alien incidents) with the action required by an FPS (Kill lots of bad guys. A lot.). Your weapons all splatter aliens into puffs of multicolor goo. The cutscenes and briefings then reference how a “Regen Team” comes in after to reanimate the aliens molecularity for intergalactic trial. Whaaa? I’m guessing they can’t “kill” aliens in a kid’s show, but why not throw in some capture guns there? Or maybe disappearing (vaporized) enemies is what keeps that engine running so smooth, and the plot just has to deal. I have this tagged as a kid’s game, but that’s not entirely the case in terms of difficulty. Early levels are fairly easy, as you would expect, but it doesn’t take long for you to run into aliens that can put a serious dent in your health bar with just a few shots. Bosses are especially brutal, and almost require sidestepping from cover and ducking back before they can readjust their aim. If you want a fair challenge, you’ll get it. If you’re a fan of the material, then Crashdown will hit all the right points. It’s a solid shooter, faithful to the franchise (in everything but the cutscenes, at least), and a good amount of fun. It runs fine on the PS2/PS3, so it might be worth scouring for a used copy online. And if you’re not really hip to the exploits of the Men in Black, or first person shooters for that matter, then this obviously isn’t worth going out of your way for. Fun and competent shooter. Lets you play with all the toys from the film. Lots of variety in the levels. Nice engine. Cutscenes are lacking. Entire game is fun, but fairly short.